IMPORTANT NOTE : Factions 3.0.2 has some stability issues regarding zeds & loot spawns. Until the 3.0.3 update is ready, I strongly recommend trying DaiZy 2018 instead. Compared to Factions 3.0.2, it includes countless fixes and is much more stable! - Bandits and recruitable survivors AI. - 25 additional character models & skins. - Zombies spawning in forests. - Zombies reacting to AI gunshots. - Loot cycle script (triggered when sleeping at tents). [No IA] : You're the last survivor in Chernarus. [The Walking Zeds] : Zombies can only walk, there're a bit more numerous. [B.A.F] : You begin the game as the leader of a British Air Force squad. [Car Patrols] : Some bandits will be roaming the roads in vehicles. - Demonized's Clean up script included. It will handle the deletion of dead bodies. - The GLT OPA Backpacks for All mod by Legislator is included in the Addons folder : no need of rMod. - Xyberviri's Factions script : AI will react to zombies. - Krixes Self Bloodbag script is included. - Utilities menu to change the player' skin or face (press '0' twice). [HOTFIX] Should fix zombies spawns issues. - Modified zombies spawn sequence : it should help the script to keep up, especially when driving fast through towns. - Removed the "forest" restriction for the loot cycle script : it doesn't matter where you pitch your tent anymore, just sleep in it to clean up the loot piles on the map. - Added a new mission file : Walking zeds + car patrols. - [FIXED] One of the NPC models was invisible. - [FIXED] Sound fx for backpack actions. 18/01/14 : New Mission file added. - Added a [Car Patrols] mission. This mission keeps the dayz_code from spawning junks & wrecks on the roads, improving durability for AI vehicles. - Now using the ChopWood script from dayz 1.8.0.3. - [ADDED] The player can bloodbag wounded survivors. It works the same way you would bloodbag another player online. - [FIXED] 'Recruit/Dismiss Unit' options now removed on survivor's death. - Fixed other issues with the Recruit & Dismiss sequences. - [FIXED] In some occasions, loot could disappear in front of the player. - [FIXED] The respawn timer for zombies wasn't working. - [FIXED] Saving was disabled whenever an AI would get in a vehicle. - Loot should spawn a bit faster. - Minor improvements & fixes. 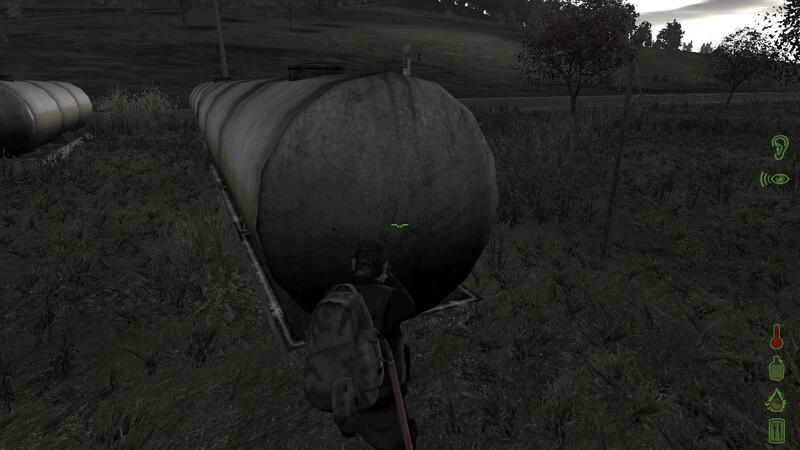 - Updated dayz_code : wrecks, junk and roadblocks now spawning correctly. - Now using a customised dayz_code. - All missions now include Daimyo's Building Script. - [FIXED] The breath fog script for the player and NPCs was missing. - The "Recruit Unit" option is removed after a unit has joined the player. - Added a "Dismiss unit" option for recruited survivors : when dismissed they'll be on their way and go helping other survivors on the coast. - [FIXED] Zombies attack animations. - [FIXED] Thirst & hunger depleting too fast on a new game. - Modified spawn & delete distances for zombies (should improve things in big cities). - Removed loop sequence from the chopping wood script. - [FIXED] Units of bandit squads now spawn together. - Added loot cycle script. It will be triggered whenever you sleep at a tent - as long as it is pitched in a forest. - You can choose how much time you want to sleep at tents. - Added an Autosave feature when sleeping at a tent, if you guys wanna play in veteran or higher difficulty mode. - [FIXED] The helicrash wrecks will spawn properly. - Helicrash loot will spawn in weapon boxes (so they aren't deleted by the loot cycle script). - Helis patrols spawn only once per trigger from now on. They'll also have unlimited fuel. - Destroyed helis patrols will respawn after some time (2 choppers max on the map). - Helis patrols will spawn further from the player. - Helis change their patrol routine every 45 minutes. - The journal will properly display how many days you survived. - Changed helis patrol spawn process (no more freezes). - Infected camps should now spawn properly (to be tested). - Tweaked Zed behaviour : it will be a bit easier to put some distance between you and them if you are spotted, but they will track you down longer than before. Even if you loose sight of them, they might still be on your trail; Infected will actually hunt for prey. - Save & Autosave will be disabled if you're in a vehicle : this will ensure that the hunger/thirst system is not broken. - Breath fog by night for every unit. - [FIXED] Some bandits were failing to identify all zeds as targets, especially those who would spawn after they did. Their spawn sequence should also be a bit less demanding on your CPU. - Mission time is now random - however you will spawn during day time. - Random tents will be guarded by a NPC. - [REMOVED] Daimyo's Building script due to some issues with the new DayZ building system. - [FIXED] Zombies not spawning anymore after several hours should be fixed. - [FIXED] Random tents now spawn properly, with or without loot inside. - [FIXED] Some vehicles were missing the damages script. - Removed the C130 at NW Airfield and replaced a couple of vehicles. - Loot will spawn at a greater distance. You can build in towns, on roads and inside buildings. - 'Remove built items' added back. - Removed the "save vehicle" option as it is not used in SP. - Optionnal files with cheats : the cheat menu has been slightly modified. You can spawn in a magic box wich will hold every weapons and items, including the ones coming from any addon or mod. - No AI mission available with, or without the cheat menu. - Updated addons to dayz code 1.7.7.1. 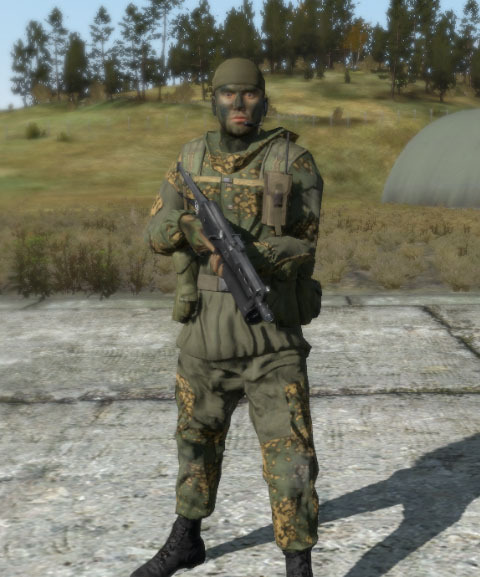 - Extended armor for NPCs to emulate DayZ health system. - Combat Roll should now work after resuming a save. - The 'Wear Clothes' action has been fixed. - Added Radio to military loot table. - Removed Epi-pen from medical loot table. - Added back : Zeds spawning while in vehicle (it was disabled with dayz 1.7.7.1 hotfix). - [FIXED] The player was unable to repack his tent. - [FIXED] Bandits could spawn with a m40a3 rifle without ammo. - [FIXED] Patrolling choppers weren't engaging the new zeds in the regular edition. - [FIXED] Food & thirst icons depleting too fast when launching a new game. - The respawn feature has been disabled due to game crashes. - Bandit units farther than 10km from the player will be deleted. This should help controlling the map population as well as save some CPU usage in long term sessions. - [FIXED] The Zeds not attacking the player after resuming a save is definitely fixed! - The loot spawn have been (slightly) improved. - Removed anti-dupe restrictions for picking up items. - The player spawn have been modified : no more Kamenka spawns! You also have a slight chance to spawn on Skalisty Island. - The bandit squads spawns have been redone. They have a chance to randomly spawn anywhere; two or three men teams, well equiped. - Added one new lootable skin for the player. - Modified patrolling choppers spawns : they can spawn at a greater distance and patrol a larger area. - "Abort" restriction on Pause completely removed. - Zeds not attacking the player after resuming a save should be fixed. 12/06/13 : Factions updated to dayz build 1.7.7. - Daimyo's Base Building script included as well. - Sleeping in tents will skip 3 hours and affect your hunger, thirst and health. It will handle the deletion of dead bodies; also unused fire places will be deleted after 30 minutes. - And of course, Xyberviri's Factions script : AI will react to zombies. - Most of the fixes introduced with DaiZy 1.7.6.1 Factions, as well as some code clean up : you might notice a slight performance boost. First thing first : update OA with the beta patch recommended by DayZ Commander! 1. Download DayZ 1.8.0.3 using DayZ Commander. 2. Download the DaiZy FACTIONS files. 3. Make a folder called "@DaiZyFACTIONS" in your Arma 2 OA directory; inside, create a folder called "Addons". 4. Add all the DayZ 1.8.0.3 files to the Addons folder inside "@DaiZyFACTIONS". 5. Copy & Paste all the files from the Addons folder of the package you just downloaded into the Addons folder inside @DaiZyFACTIONS (overwrite dayz files). 6. Add one of the mission files to your "mission" folder in your arma 2 OA directory. 7. Don't forget to create a new OA Beta Patch shortcut and add "-mod=@DaiZyFACTIONS" in the target line! NOTE : If you have an error message about missing content, you might have to copy the Addons folder from Arma 2 into your Operation Arrowhead folder. It's worth spending some time reading the documentation files if you want to customize DaiZy to your likes. A must have, especially for this release since it greatly enhances AI units skills. NOTE : There's a glitch with the bayonnette knife mod : it spawns NVGs in the player's inventory. - The J.S.R.S Sound Mod : replaces Arma 2 sounds; you can also configure it the way you want (just follow LordJarhead's instructions to remove sound files). Please note that the following file conflicts with roadflares & other throwable objects sounds : "jsrs_grenade_c.pbo"
- LandTex (included in coWarmod) : greatly enhances landscapes textures. - The Community Base Addons are required to run the above mods. - Do not save & reload while inside a vehicle! The thirst & hunger features currently don't work in vehicles. - Bandit squads & choppers can't engage each others (they are on the same side). - I've removed pistols from AI units in order to prevent them being stuck when switching weapons (it's an old Arma 2 glitch wich occurs with spawned units). However, if you're using the auto-rearm feature from CoWarmod, your units might pick up a secondary weapon when they have the chance. If you notice that one of your units is unable to move, with a pistol drawn, just open your map, go to the 'units' menu and click on 'gear'. Make him drop his rifle and he will move again. CREDITS : AboveDayZ, Fedus_87, Niceonegunit, DayZ_SP, Unknown, ZedHunter & Haleks. A couple of additional notes fellas : the humanity function still doesn't work sadly. And I think the infected survivor camps aren't working either; I'll have to add them later. Other than that, it should run fine - don't hesitate to report any issues! Also for now, it has dayz vanilla loot table, except for the custom skins I added. The vehicles are the same as before. Thanks so much for the update. I will download and start testing as soon as I get home. To be considered as a 'beta' release! Smells good, will be giving this a try. One thing for you guys who run the CoWar mod : I don't recommend using the 'asr_ai_sys_aiskill' file. It seems that it is conflicting with the DayZ AI : NPC don't fire their weapon and Zeds don't try to hit the player... As soon as I deactivated it though, it was gunshots fest in town. Awesome stuff! All installed and about to partake! I really gave DaiZy 2017 a truckload of patience last night and it paid off! At first I thought that the zombies were doing way too much damage, but the trick is simple really... just don't aggro zombies and get hit. I guess that I too fell into the trap of being 'too used' to zombies being more of an irritant than an actual threat. Being able to play these mods single player is really really good, because you can't just prone-crawl across Cherno online. No way. Them pesky people who just love picking off the unarmed! I've seen a lot of unhappiness over 1.7.7 on Reddit, and I personally had a quick go before another bullet to the head without warning or even being held up! (Frankie1080p style!). I will spend the next couple of hours with this to see how it plays out! Thanks Haleks for putting the time into these awesome single player versions! It's a... Cough different game! Taking a quick... Cough break but returning very shortly! I was reading some feedback on the 1.7.7 patch; most of people seem to agree on the fact that DayZ is becoming an actual survival game. Being a fan of 2017, I must say I'm quite happy with the direction they took with this update. I agree with what you say Haleks. The only problem I'm having is finding any antibiotics! The ones I thought they were in the window were tin cans, lollums! I have discovered a problem/glitch/bug so far. The zombies have decided that I'm alright after all and have befriended me! When I loaded it back up and resumed my game, something somewhere has gone wrong I believe as I have been running down the open streets passed loads of staggering zombies and not one has aggro'ed at me. What I tend to do (because you can only save once) is suspend my game and close Arma 2. Then go to my C:\Users\crowbars82\Documents\ArmA 2 Other Profiles\crowbars82\Saved\missions folder and zip up the DaiZyFactions2.2[Bandit Edition].chernarus folder into a .TAR file. So if I die I can quit the session back to the main menu, alt-tab, unzip the .TAR overwriting the previous save, alt-tab, resume mission! I've been saving my game using this method for the past 4-5 versions and it's worked a treat :) I am guessing that the non-aggro zombie issue was caused when resuming a mission? I am guessing that the non-aggro zombie issue was caused when resuming a mission? I will look at it tomorrow and try to find out what's wrong - from what I've seen they still aggro you but fail to do the attack animations. Cool dude. Looks like my time is nearly up in this playthrough anyway... a team of 3 bandits are making their way down the hill to the petrol station west of Elektro! Their aim is somewhat... good! I have 6 rounds in my M1911 too... yikes! Seems to work just fine for me. I just posted a quick test video on my channel. AI firing, zombies attacking all with the 'asr_ai_sys_aiskill' installed. Maybe because I am using the latest beta or something. i know u guys work hard on these but every time i restart the first hit gets me infected and knocks me down. I think this is down to the actual 1.7.7 mod. It is rather... unforgiving now, best way I can describe it! The only advice I have at present is to not get hit. I managed this for about 15 minutes myself, crawling around Elektro, until I heard gunfire nearby so I crawled into a building to peek out the window... but didn't notice the proned zombie under the table!